Rockstar has just announced the Max Payne 3 downloadable content plans with a full lineup of multiplayer content planned for release this summer and beyond! It will all start with the Local Justice Map Pack coming out in June. 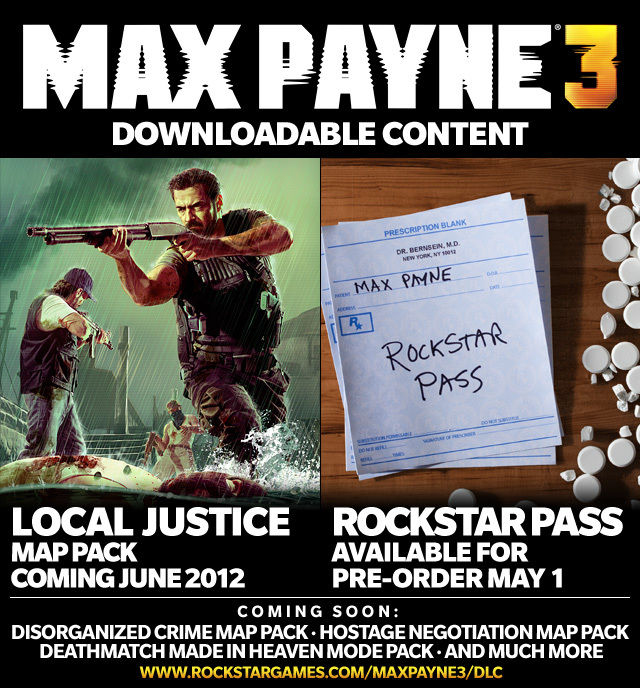 Players will also be able to order the Max Payne 3 Rockstar Pass to get all of the upcoming DLC at a special discounted rate, compared to purchasing each pack individually. Starting today, the Rockstar Pass can be pre-ordered for Xbox LIVE and PlayStation Network from Best Buy or GameStop in the United States (or pre-ordered for PSN directly from the PlayStation Store). The Rockstar Pass grants you access to all upcoming Max Payne 3 DLC and will be available for 2400 Microsoft Points (Xbox LIVE), or $29.99 (PlayStation Network and PC) – over a 35% discount compared to purchasing the content individually. Once purchased, the Rockstar Pass enables gamers to download all DLC releasing through the end of 2012 via the in-game store as soon as it is made available on Xbox LIVE, PlayStation Network, or PC. The Local Justice Map Pack, coming in June, will include the Police Precinct map for Gang Wars, Deathmatch, Team Deathmatch and Payne Killer multiplayer modes. The pack will also feature two additional maps for Deathmatch, Team Deathmatch and Payne Killer, new precinct-themed multiplayer avatar items, multiplayer challenges, and more! Awesome for Max Payne fans but very concerning for Grand Theft Auto fans... Join us at the GTA V forums! you didn't really hoped, did you? i could bet for around may 2013. the april-june period. All your 2012 belong to Max Payne 3.